!! 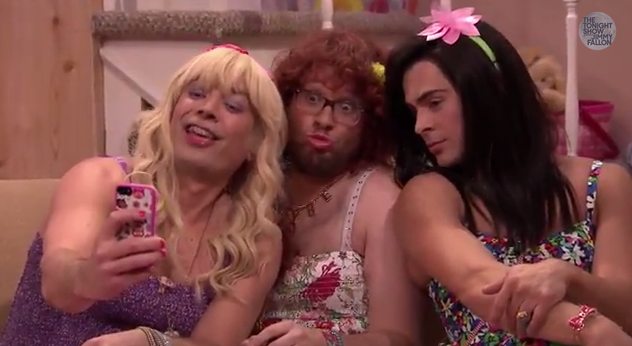 OMG, “EW!” Jimmy Fallon drags it up on ‘Teen Nick’ show with Seth Rogen and Zac Efron !! Jimmy Fallon‘s fake Teen Nick show “EW!” has had notable guests like Will Ferrell and Channing Tatum dragging it up in his basement with people like Michelle Obama, and last night Seth Rogen and Zac Efron joined Jimmy for a special episode on ‘selfies’. Zac is giving us some all-American Ja’mie King vibes! Check it out below! Be the first to comment on "OMG, “EW!” Jimmy Fallon drags it up on ‘Teen Nick’ show with Seth Rogen and Zac Efron"